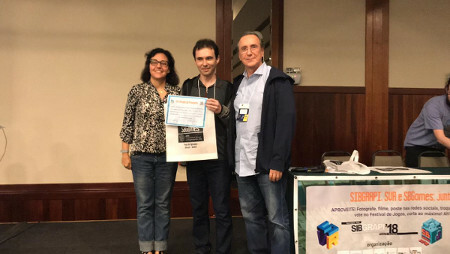 The Logtell Project won the Best Paper Award in the XV Brazilian Symposium on Computer Games and Digital Entertainment. The Logtell Project won the Best Paper Award in the 14th International Conference on Entertainment Computing. The Logtell Project won an Honorable Mention for Best Paper in the Brazilian Symposium on Multimedia and Web. The Logtell Project won the Best Paper Award in the XVII Brazilian Symposium on Computer Games and Digital Entertainment (SBGames 2018) with the paper "Personality and Preference Modeling for Adaptive Storytelling", which is authored by Edirlei Soares de Lima, Bruno Feijo, Antonio L. Furtado, and Vinicius M. Gottin. The SBGames (Brazilian Symposium on Computer Games and Digital Entertainment) is the largest and most important academic event for games and digital entertainment in Latin America. It is attended by scientists, artists, designers, teachers and students from colleges, universities, research centers and the game industry. The paper "Personality and Preference Modeling for Adaptive Storytelling" explores personality modeling and proposes a novel approach to generate individualized interactive narratives based on the preferences of users, which are modeled in terms of the Big Five factors.